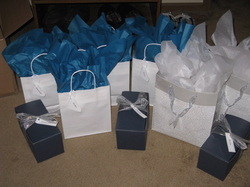 We have a great wedding party and we hope they enjoy their gifts as much as we enjoyed picking them out. Our wedding party has 4 bridesmaids, 4 groomsmen, 2 flower girls and 2 ushers. 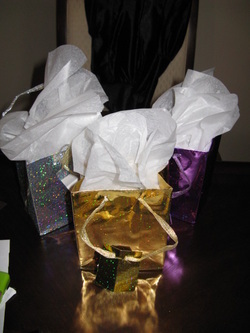 Gifts for each are shown below. I have 3 bridesmaids and an MOH. 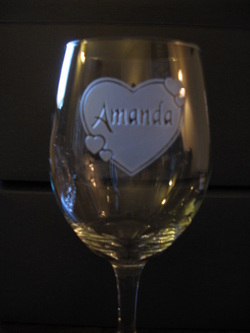 I ordered them each a personalized wine glass. We all love our wine and I sure hope they like them. I plan to give them each the glass, a bottle of wine and maybe a bottle stopper too. 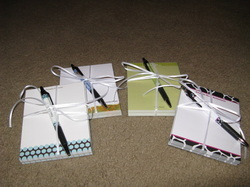 I also purchased personalized stationary from VistaPrint for each of them and a small travel sized manicure set. 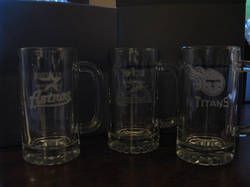 I purchased one glass for each girl, 4 in total. 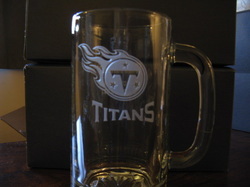 The designs are etched into the glass, not painted. Even the wording on the bottom of the stand is etched. It is so small and delicate. They look amazing and these photos do not do them justice! 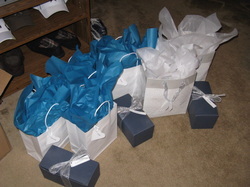 VP items all wrapped up and ready to go in the bags with the wine glasses. All packaged up and ready to go . . I love that I was able to find tissue paper in a color that almost matches the girls dresses! A gift for all the ladies . . 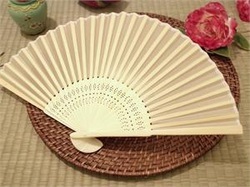 I just purchased little hand fans for all the ladies to have and use on the wedding day. We are getting married in July in mid-Missouri. It's going to be HOT! 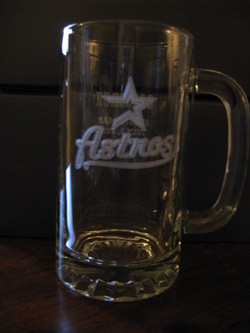 We will also have a cooler filled with water for the day of. 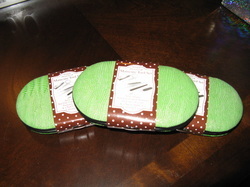 I purchased them from efavormart.com during one of thier weekly sales for 91 cents each. Three of my four BM's hosted a shower for me here in Columbia. 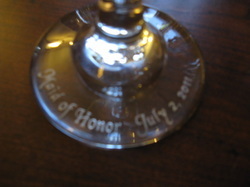 The fourth was unable to attend because she lives out of state and is going to school, totally understand. I wanted to get each lady a little thank you gift though because they have done a wonderful job planning and I know its going to be a blast! I purchased during the after Christmas sale at JcPenny a travel sized manicure set for each girl. 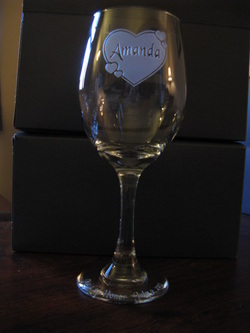 I had originally thought of them as part of their BM gift but it just didn't fit in with the wine glasses so they became shower gifts. A little hard to see but they are the cutest little things in person. 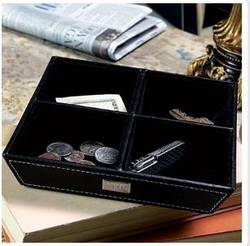 The outside case is made of a green leather matter which should hold up really well for them. In there little bags ready for the shower. The small gift bags were purchased at the Dollar Tree (3 for $1) and the manicure sets fit perfectly! FI has 3 groomsmen and a bestman. His bestman is his brother who will be 14 at the time of the wedding. 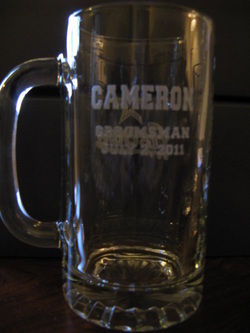 The 3 groomsmen are each getting a personalized beer mug.The mugs are pictured below and feature the logo of their favorite team, their name and the wedding date. Like the wine glasses these photos do not do these mugs justice! 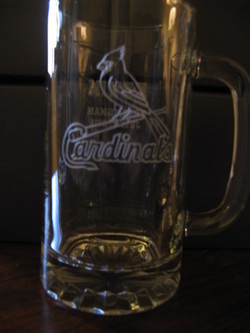 The mugs were purchased from the same etsy seller as the wine glasses for the girls were. 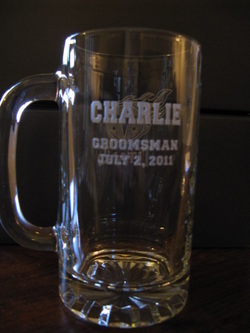 FI's brother and bestman will be getting a personalized pocket knife and maybe a few other things too. 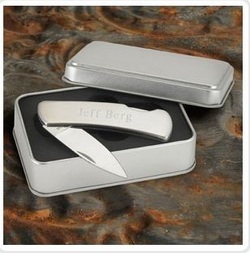 Personalized pocket knife from groomstand.com. 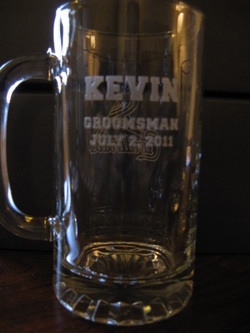 The bestman is only 14 so a beer mug was not in the cards for him. He is big into Boy Scouts so we hope he will like this. Our two flower girls are sisters and are just to cute! 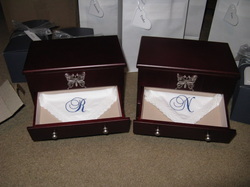 I got them each a jewerly box and a monogram hankie. I found the idea for the monogram hankie on The Knot and really thought it was neat and that they would enjoy it. They will be 5 and 8 at the wedding and are very girly. 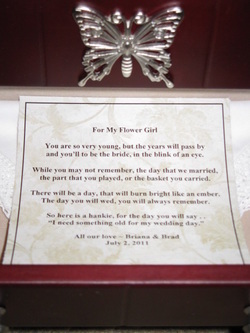 I will place the hankie in one of the drawers of the jewerly box and include a poem with it as well. The flower girl poem is . . .
and you’ll to be a bride, in the blink of an eye. the part that you played, or the basket you carried. There will be a day, that will burn bright like an ember. 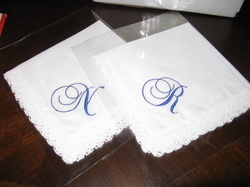 So here is a hankie, for the day you will say . .
More pictures to come . .
Monogramed hankie. I had the letters done in blue so that some day it could be the something old or the something blue. I printed the poem from above on a piece of pretty cardstock and cut it out. 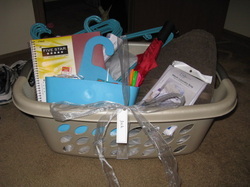 One first usher . .
For our first usher we decided to do a going away to college basket. 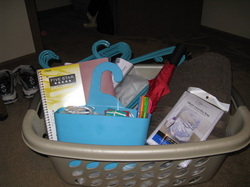 He is going to college in August and these items will be great for him! Just added a little bow and name tag. I think it looks great! These are stock photos but better than what I could have taken.